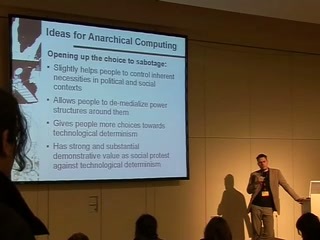 media.ccc.de - Playlist for "Free Software and Anarchism"
Playlist "Free Software and Anarchism"
The mode of production in free software development is often being described as anarchical. Despite this attribution seems not initially intended in any fundamental political sense, this sense starts to transfuse the discussions. This invites to a closer look at the reference: what it is, what it's not and what it could be. And once viewed from general anarchist theory and the anarchist theory of technology, any political relation seems to vanish. But despite this first stance, a demonstrative value can still be obtained as soon as some critical remarks are acknowledged and some developmental frames would be changed.